You conduct a Web search on your iPhone in pretty much the same way you search the Web on your home computer. The iPhone relies on the Google and Yahoo! search engines, although you can use others if you have a preference by going directly to a search engine’s url. Although you can certainly use the virtual keyboard to type google.com or yahoo.com in the Safari address field, Apple doesn’t require that tedious effort. Instead, you tap into Google or Yahoo! via the dedicated search box. The default search engine on the iPhone is Google, with Yahoo! being the first runner-up. 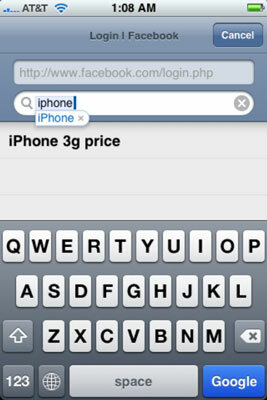 To conduct a Web search on the iPhone, tap the address field and then tap the Google (or Yahoo!) search field. Enter your search term or phrase and then tap the Google (or Yahoo!) button at the bottom right of the keyboard to generate pages of results. Tap any search results that look promising. To switch the search box from Google to Yahoo! and vice versa, tap Settings on the Home page, scroll down and tap Safari, tap Search Engine, and then tap to choose one search behemoth over the other.